As promised here is the continuation of the night of debauchery hubby and I took part in. When I heard that the Rocky Mountain Wine and Food Festival was in Edmonton this last weekend, I suggested a road trip to him and he just laughed. I guess he didn’t want to go to Edmonton that badly! As I left you in the the last post I had been chatting with the representative for Big Rock. He pointed out that there were three more brews slated to be released in 2013. These are the Italian Plum Beer, Licorice Porter, and Spruce Beer. I was most intrigued with the Spruce Beer because I remember back in the days we took our young family hiking, showing them edibles along the way. They never seemed to impressed with spruce ‘gum’. I am interested to find out just how ‘sprucy’ this beer will be. After the beer we wandered for a bit, trying samples of spirits and liquors before we ended up at the PMA table. Our friend Bernard, the PMA representative gave us a taste of Two Oceans Pinot Noir and Sauvignon Blanc from South Africa. They were both great but I do have to say at this point my palate was completely smashed (just my palate, mind you!). Bernard let us know that the next wine group meetup would be a lovely dinner at Xocolat: Post Mexican Cuisine complete with wines from Sokol Blosser. On the left is my chicken taco de alambre with a mild tomatillo sauce and on the right was hubby’s pork taco de alambre with some really freaking hot sauce. As you can tell, he really loaded it on! He definitely regretted that decision and went in search of beer soon after he finished devouring it. 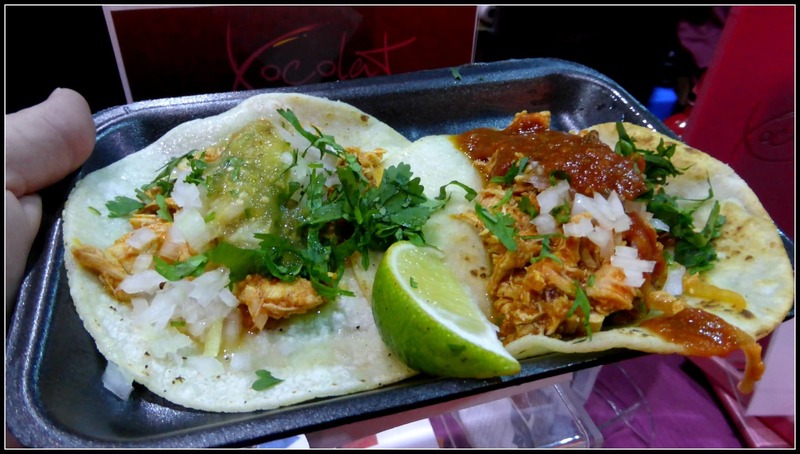 Both tacos were really great and I can’t wait to go to Xocolat for a full meal November 5th. While hubby was out finding beer to put out the fire he started in his mouth, I found a Greek food stall and loaded up on dips, pitas, and dolmades. The dips were Tzatziki, tadama, tyrokafteri. 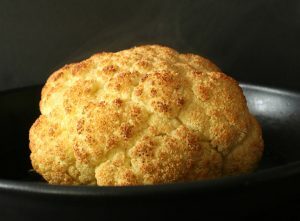 Unfortunately by this time I really was getting full and had no room to try the delicious looking mustard roasted lamb. 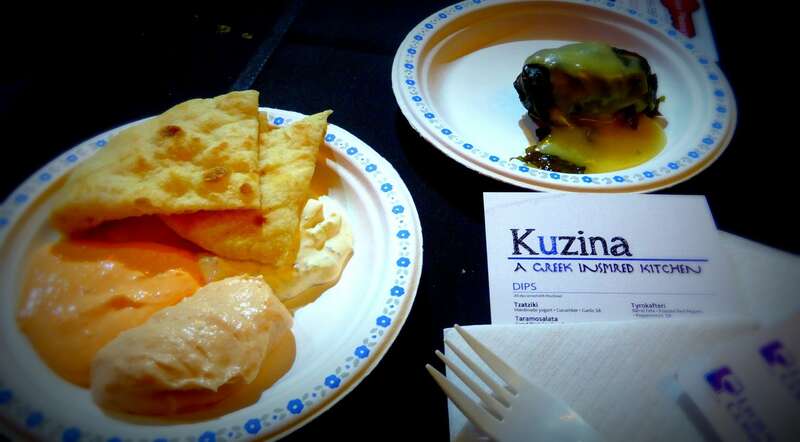 I think a future visit to Kuzina: A Greek Inspired Kitchen is definitely in order! 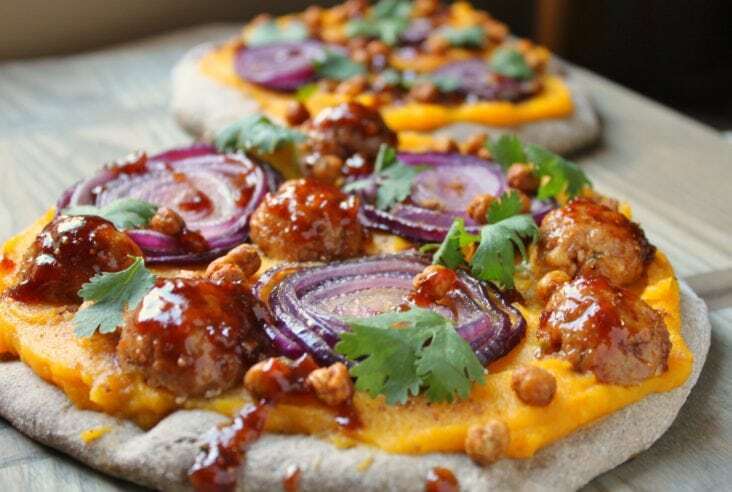 I think the festival is a superb chance for local restaurants to represent themselves at their very best and for the most part that was true. Our only disappointments came from Wine-ohs Bistro and Cellar. Hubby had the Cinnamon roasted Duck Breast on Crostini which was cold and chewy and not at all flavourful. He love duck and was not impressed at all. I opted for the Chanterelle and Rocket Tartlet. Oh yuck. The pastry was so thick and gluggy and the mushrooms were cold and had no flavour at all. Worst of all, this was the booth that charged the most…10 coupons for that nasty tartlet. There were so many other places that were able to entice us to visit their restos and this wasn’t one of them. I didn’t even bother with a picture. We were going to leave but then decided to get the yucky taste out of our mouths. Luckily there was one beer stand we hadn’t visited. Hubby had the German Maisels Weisse and I had the Belgium La Chouffe. 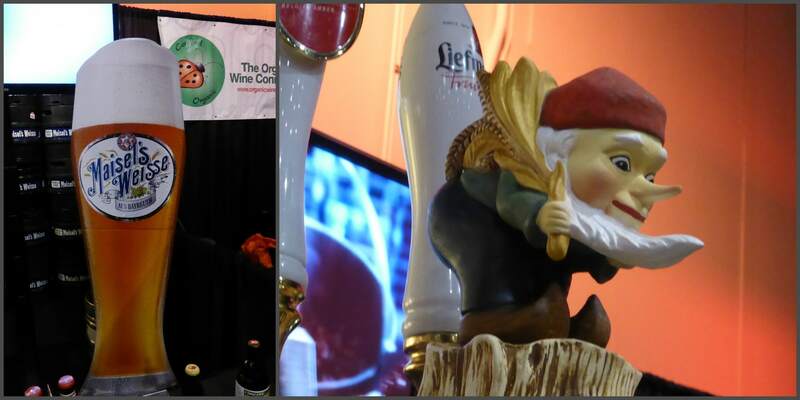 I loved the little gnome on the pull tap. 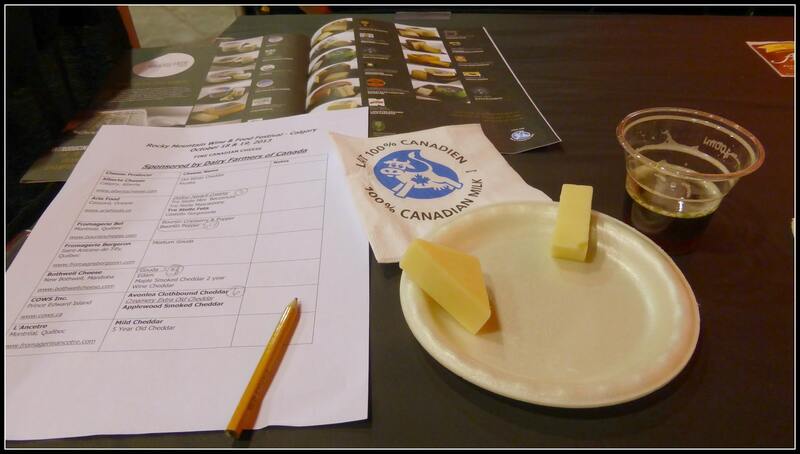 We were about to call it a night after those refreshments but we ended up walking by the Dairy Farmers of Canada Cheese Pavillion right when they were to begin a cheese tasting. What luck! We found two empty seats and watched the servers carefully placing cheese on our plates. The presenter made several jokes about the audience not being able to follow along and I decided to prove him wrong no matter what! I love my cheese! We started out with a mild tasting Queso Duro which was slightly spongy and salty, a bit like the haloumi we enjoy so much. Next up was a creamy Havarti, medium Gouda, aged Cheddar (from Armstrong, B.C. near where my sister lives), and Pepper Boursin. Our last cheese was a very intriguing Clothbound, extra old Cheddar from Prince Edward Island. I was really amazed when I smelled the distinctive potato aroma coming from the cheese. The presenter explained every cheese but it was really loud so I lost out on a lot of the explanation. When I asked him later about the PEI cheese he said the potato aroma was purely from the provenance of the cheese, meaning the salty sea air, soil and rainwater gave it that distinctive scent. I must add that there was very little potato in the flavour of the cheese. All told, hubby and I had a marvelous night. I think we are definitely in again for next year’s festival!